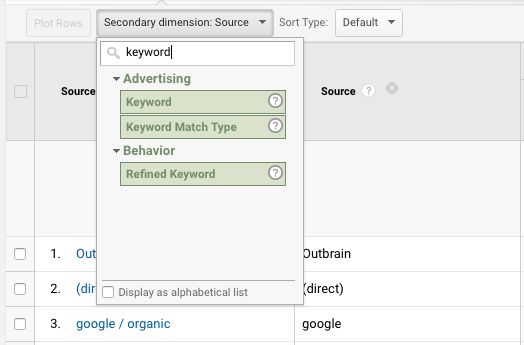 Outbrain enables you to see your campaign performance in Google Analytics broken down by referring source. This allows you to identify the underperforming referring sources and block them. Learn more about how to add UTM codes to your campaign here. After the campaign has received clicks, open Google Analytics and choose the right date range. Head to Acquisition >> All Traffic >> Source/Medium. Locate the source/medium combination you had selected. We recommend using “Outbrain/Discovery”. Click Secondary Dimension, and choose Keyword. You can then view you the referring sources that promoted your Outbrain campaigns and monitor their performance. Reviewing this data will allow you to optimize your campaigns accordingly. You can then break out the data in your Outbrain dashboard and match up the section names with the ones you see in GA.
Be mindful of how many sources you exclude. You will only be able to remove a maximum of 30 publishers and 100 sections. We only recommend excluding a source if it is underperforming after 400 clicks.